Nearly all of London's major public galleries are completely free so you know you're not compromising on quality by choosing the cheaper option. Lots offer free talks and tours if you time your visit cleverly. Some special exhibitions do attract an admission fee but there's more than enough in each gallery to keep you well and truly absorbed without having to pay to visit these. 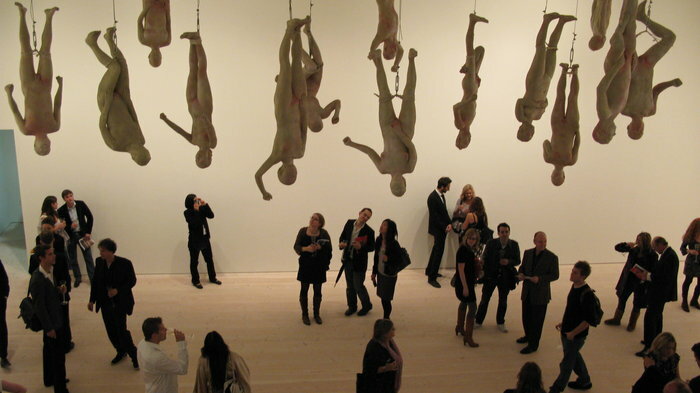 The Saatchi Gallery re-opened on 9th October 2008 in the former military barracks of the Duke of York's Headquarters. The 70,000 square feet represents a significantly larger space than its previous 40,000 occupancy at County Hall. Ousted from the Southbank site in 2005, the re-location of the gallery had long been speculated upon and hotly anticipated. The former ad man Charles Saatchi made the transition to the art world in the 1990s, championing young artists and buying in bulk the works of Young British Artists like Damien Hirst and Tracey Emin. In keeping with this trait, the gallery includes a dedicated space for emerging artists from the Saatchi Online website. The winners of the award display a range of images taken during an expedition to the Arctic that highlight the changes to the area due to global warming. The National Gallery dominates over London's Trafalgar Square as it dominates all other galleries in the city in terms of world renown. Some of the finest examples of European art, ranging from 1260 to 1900, are included among the 2300 paintings filling its halls and rooms. Holbein's 'The Ambassadors', 'The Hay Wain' by Constable, and Jan Van Eyck's 'Arnolfini Marriage' are just some of the major attractions. Works on display also include those of Botticelli, Monet, Constable, Van Gogh and Rembrandt. This really is the place to come for top quality artwork spanning a wide spectrum of styles and periods. From the Early Renaissance to the Post-Impressionists, every significant stage in the development of painting is represented in its collection, often by masterpieces. Originally established by Parliament in 1824, the collection belongs to the British public and every effort is made to encourage the public to visit, view and experience the art: free entry, free events, free talks and free tours support this ethos of encouragement and enthusiasm. Regular weekend activities include: guided tours at 11.30am, 2.30pm with extra tours at 12.30pm and 3.30pm on Saturdays, lunchtime talks on Saturdays at 1am, and Art Through Words sessions for visitors with a visual impairment at 11.30am on the last Saturday of the month. This isn't the place to come for serious works of exceptional artistic merit - the overriding aim of the National Portrait Gallery is to reflect the status of the sitter, not the artist - but where else in London could you hope to find The Beatles, Henry VIII, Sir Richard Branson and JK Rowling all hanging out together? The appeal of this gallery (opened in 1856) rests simply in its comprehensive commemoration of British history from the late 15th century to the present day through the medium of portraiture. The sense of progression and the feeling of familiarity with many subjects are what make the gallery so appealing. Having said that, critically acclaimed self-portraits by William Hogarth, Sir Joshua Reynolds and other notable British artists are also displayed alongside the 10,000 portraits of everyone from statesmen to showbiz stars and media barons. The collection represents Britain and is arranged thematically, starting with the Tudors and ending with present day politicians and pop stars. Look out for the only surviving portrait of Shakespeare taken from life in The Ondaajte Wing, the Hans Holbein cartoon of Henry VIII, the anamorphic portrait of Edward VI, and the sculpture of Queen Victoria and Prince Albert in medieval costume. Photographs, caricatures, drawings and sculpture are included in the collection which also boasts 250,000 archived images. The National Portrait Gallery also hosts the annual Portrait Prize competition alongside ever-changing collections of contemporary work. Damien Hirst's gallery won the Riba Stirling Prize, the UK's leading architecture award. Damien Hirst's Newport Street Gallery has been built to bring his collection of over 2,000 artworks out of storage and on display to the public. Taking up the whole length of the Vauxhall street, the gallery - a combination of three listed buildings flanked by new buildings at either end - was designed by Caruso St John, the archtects behind the £45 million masterplan for Tate Britain's 2013 facelift. It's really six spaces in one which can used in different combinations to show Hirst's private collection - which includes pieces by Francis Bacon, Jeff Koons and British artists Sarah Lucas and Banksy - in small or very large exhibitions. "It's my Saatchi gallery, basically," he told the Observer in a 2012 interview. "It's a place to show my collection of contemporary art. It feels bad having it all in crates." Britain's leading centre for contemporary photography. The Serpentine provides a platform for contemporary artists, both British and international, with changing exhibitions. There's a permanent work comprising eight benches, a tree-plaque, and a carved stone circle by artist and poet Ian Hamilton Finlay in the grounds of the gallery which is dedicated to the Serpentine's former Patron Diana, Princess of Wales. In July, the annual Summer Party is a highlight on the party circuit, attracting celebrities, fashionistas and models showing the latest designer dresses. Rather more artistically important is the Summer Pavilion; each year a distinguished architect is invited to build a temporary structure which sits alongside the gallery for the summer months. Often controversial and always a talking point, the Summer Pavilion is arguably one of the most interesting exhibitions that the Serpentine presents. More than 60 rarely seen drawings by the Swiss visionary artist, healer and researcher, who died in 1963, reflecting her preoccupation with spirituality and forms of abstraction. Overlooking the River Thames, Tate Britain was originally founded through the philanthropy of the sugar magnate Sir Henry Tate. The Tate legacy now encompasses three other galleries around the UK, including Tate Modern also in London. Dedicated to showcasing Britain's artistic talent, Tate Britain is home to the greatest collection of British art from 1500 to the present day. Since it opened in 1897, the collection has expanded to include works from Blake, Rossetti, Spencer and Stubbs. It also hosts the Turner Prize - the contemporary art world's premier award. Turner's Gallery (another tribute to the artist himself) is a virtual reconstruction of the room in which Turner showed his own paintings. Housed in the former Bankside Power Station, Tate Modern pays homage to art from 1900 to the present day. Located along the banks of the River Thames, the gallery opened to great acclaim in 2000 and has since welcomed millions of visitors through its imposing doors. If you are visiting for the first time, you should approach from Blackfriars station, crossing Norman Foster's 'Blade of Light' footbridge walking towards this spectacular modernist masterpiece with the dome of St Paul's Cathedral behind you. The awesome Turbine Hall creates a stunning entrance and a vast space, used to display temporary installations on a grand scale. There are three levels of galleries enclosed by a spectacular two-storey glass roof that provides fantastic views of London and a great cafe. Full of the jokey eccentricities of contemporary art, it's one of the few art galleries that children and teenagers will enjoy, but it also offers the full set of iconic twentieth century artists, from Matisse to Moore, Dali to Picasso. Justifiably the most popular art gallery in Europe. A striking extension to Tate Modern, with underground chambers and a free open air viewing platform. A dramatic new development at Tate Modern, we got our first glimpse inside The Tanks in summer 2012 - revealed as part of the Cultural Olympiad in the 2012 Olympics - before they were fully opened to the public in summer 2016. The giant underground chambers, previously used to store a million gallons of oil, now host new audio works, installations and film installations as well as performance art. The striking extension, which cost £215 million, consists of two large circular spaces for performances and film installations, and smaller rooms which retain the smell of their industrial past. There's a room dedicated to Louise Bourgeois, a ground floor cafe and a restaurant. All very impressive. But the crowning glory is the free open air viewing platform on the top floor. Views over St Paul's, the River Thames and Millennium Bridge compete with those into neighbouring luxury apartments. Obey the signs saying 'respect the privacy of our neighbours', if you can. Free art classes and workshops, talks and tours, bring alive to visitors the varied works of art on display in Hertford House - the original family home of The Marquesses of Hertford and Sir Richard Wallace. European paintings, miniatures and sculpture, French 18th-century furniture, Sevres and Meissen porcelain, goldsmiths' work and Oriental and European arms and armour combine to form one of the finest collections of art amassed by one family. Sir Richard Wallace - the illegitimate son of the 4th Marquess of Hertford - built up the original collection left to him by his father. Several Old Master paintings, notably 'The Laughing Cavalier', works by Rembrandt, Van Dyck, Reynolds, Rubens, Gainsborough, Titian and Romney make this gallery a worthy rival of others in the city. Renovations to the town house, which uniquely occupies the whole side of a garden square, include a glass-roofed courtyard - home to Oliver Peyton's brasserie - four new galleries and educational facilities. The acquisitions, bequeathed to the nation by Wallace's widow in 1897, are all free to view. There are regular tours during the week and weekend tours take place on Saturdays at 11.30am and Sundays at 3pm. 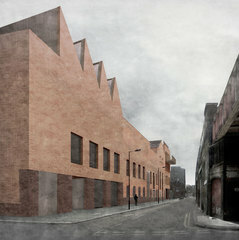 At a massive 58,000 square feet White Cube Bermondsey Street is the largest commercial gallery in Europe. Jay Jopling's third - and largest - White Cube art gallery in London is located on Bermondsey Street and set in a former 1970s warehouse. At a massive 58,000 square feet White Cube Bermondsey Street is not only the largest art gallery within Jopling's White Cube empire but also the largest commercial gallery in Europe. A timely opening during the 2011 Frieze art fair, on 12 October 2011, launched the gallery to the world's richest and most influential art buyers. Designed by Casper Mueller Kneer Architects, the building has three principal exhibition spaces, substantial warehousing, private viewing rooms, an auditorium and a bookshop. The exhibition spaces are divided into the 'South Galleries', the principal display area, three smaller 'North Galleries', and the '9 x 9 x 9' gallery at the centre of the building. Frequently changing exhibitions by contemporary artists of the calibre of Jopling favourite Damien Hirst are supplemented by an education programme, artists' films and lectures. The first White Cube - one of the smallest exhibition spaces in Europe - was set up in Duke Street (1993-2002), not far from the current White Cube Mason's Yard which opened in September 2006, six years after White Cube Hoxton Square opened in April 2000. Free-to-view, cutting edge art in hipster East London. A leading part of the ferociously fashionable East London art scene, White Cube Hoxton Square, the first of White Cube's three London galleries, is invariably filled with some of the world's most cutting-edge art. Owner Jay Jopling is as A-list as the artists he collects. Damien Hirst, Tracey Emin, Antony Gormley, Jake and Dinos Chapman, Gilbert and George and his former wife Sam Taylor-Wood are all represented and their works shown at the three galleries and beyond. Occasionally, for really large exhibitions (like Gilbert & George's Jack Freak Pictures), artworks are spread across two of the White Cube galleries at Hoxton Square, at Mason's Yard and at the third and largest White Cube in Bermondsey - all of which are free to visit. Designed in a distinctive Arts and Crafts architecture style by Charles Harrison Townsend, the Whitechapel, Britain's first purpose-built arts gallery, is renowned both for the beauty of its light, airy space and for embracing the local community in its work. Founded in 1901, extensive refurbishment saw the gallery double in size when it reopened in April 2009. The gallery does not have a permanent collection, preferring instead to host a constantly evolving programme of works and there is always something free to see. Community projects and retrospective exhibitions now rest alongside landmark examples of contemporary work. The Pop Art 'This is Tomorrow' exhibition of 1956 is often hailed as the gallery's most iconic event, although there are a number of other exhibitions worthy of note. Picasso's 'Guernica' was displayed here in 1938, Jackson Pollock had work exhibited at the gallery in the 1950s, David Hockney's first show was held here in 1970 and Lucian Freud had a major exhibition in 1993. With its pillared supports and high ceilings, The Lower Gallery, in particular, is a fantastic exhibition space. From cheap budget places to stay to luxury 5 star suites see our special offers for hotels, including Hilton London Tower Bridge from 60% off.